Spectacular views, indoor/outdoor living spaces, and state-of-the-art amenities inspired six of the last year’s greatest home sales. By Steven Biller. Photography by Brian Thomas Jones. The entertainer’s Southridge house — a Palm Springs landmark — is for sale for the first time. Distinguishing the historic neighborhoods of Palm Springs offers residents a sense of pride and privilege. Grammy winner, civil rights crusader, and Broadway powerhouse Cyndi Lauper returns to Palm Springs for an evening under the stars. By Judd Spicer Photography by Raymond Shadman. Propelled by his family’s name, Dave Stockton finds his groove in teaching and enjoying the desert lifestyle. By Judd Spicer Photography by Marc Glassman. 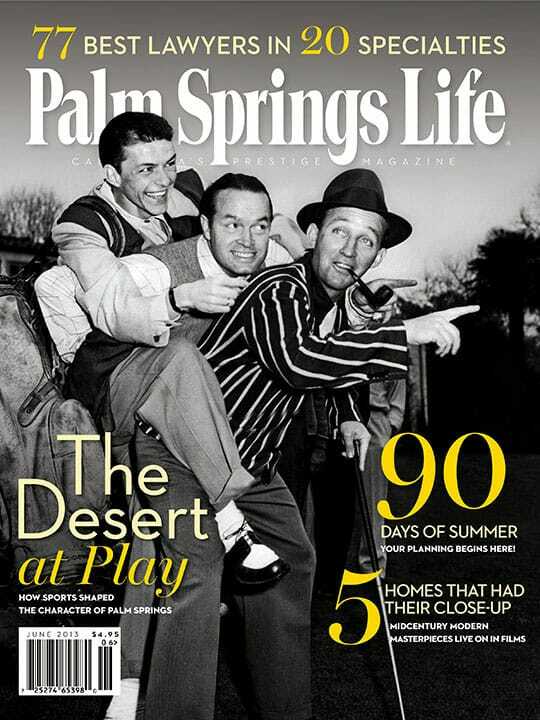 An all-star cast instructs golfers at The Vintage Club in Indian Wells. By Steven Biller, Mona de Crinis, and Joan Page McKenna. Photography by Adrianne Bonafede, Gary Bindman, Gerry Maceda, Greg Peterson, and Dylan White. El Paseo Remix Local March madness put lovers of the latest in clothing and accessories on cloud nine. How real estate got its groove back. Mother’s Day by the numbers, Q&A with actress Samantha Ressler, and the desert’s lone Craftsman home goes on the market. By Carolyn Patten. Photography by Raymond Shadman. Janice Lyle takes the reins at Sunnylands. By Lawrence Karol Photography by J. Everette Perry. Tommy Bahama: hooked on a feeling. By Steven Biller and James Powers. Inspired jewelry by Temple St. Clair, quarter-share ownership at The Residence Club at PGA West, and Seven Lakes Country Club celebrates 50 years. Homeowners gain influence in the desert real estate market.